Sure, California has alluring beaches, Texas lacks income taxes, and Florida is never short on sunny days. But what do they all have in common? Special district financing. Developers work with local governments to create special district financing to fund the significant up-front costs of large communities, including roads, utility lines, drainage, schools, and amenity construction. Special district financing (or special tax financing) is available up front and at a much lower cost than other capital, such as private equity. The finance costs then get passed on to the eventual homeowners, who presumably pay a lower home price in return for shouldering the debt service. 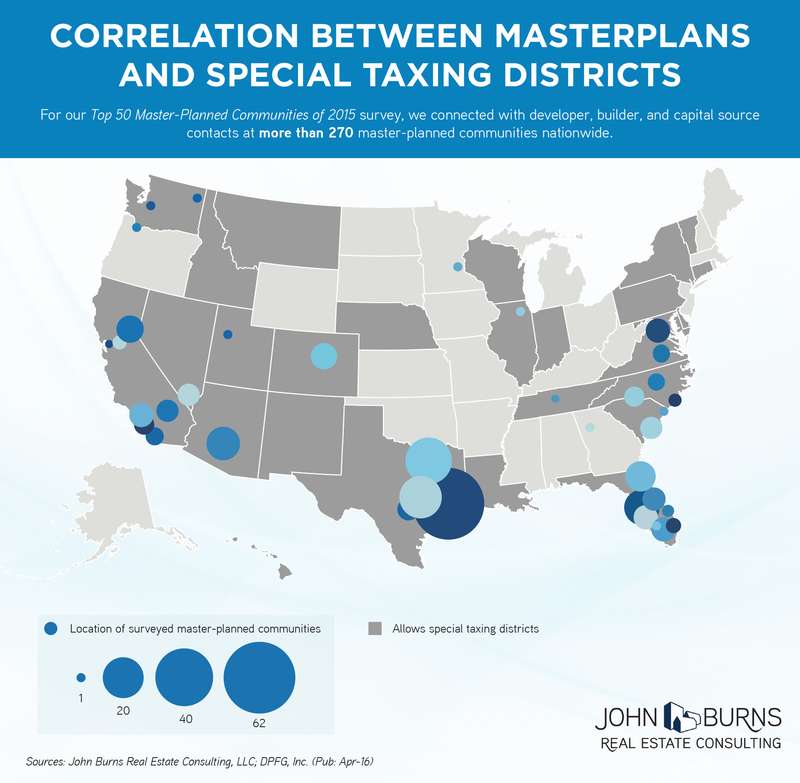 The map above shows the locations of more than 270 master-planned communities that we surveyed for our annual 50 top-selling masterplans ranking, overlaid with the special taxing districts. Texas allows developers to use municipal utility districts (MUDs) and public improvement districts (PIDs) to fund infrastructure. In fact, that state boasts 17 of the 50 top-selling master-planned communities (MPCs), including 9 in Houston—the most of any metro area. 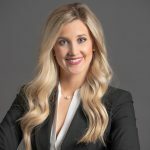 Florida developers can utilize community development districts (CDDs) in Florida, which is home to two of the top three MPCs that combined produced 3,399 new home sales in 2015. Nevada permits developers to use special improvement districts (SIDs) either in the form of general improvement districts (GIDs) or local improvement districts (LIDs). Three of the top 25 MPCs, including one masterplan with 281% YOY growth in net sales, are located in Las Vegas. California developers can employ community facilities districts (CFDs), commonly known as Mello-Roos because of the two legislators who sponsored the bill that allows these districts. The state represents the most geographically diverse group of MPCs, which make up one-fifth of our top 50 ranking. (Colorado/Arizona) Some of the largest masterplans in the country are located in Denver and Phoenix, and although special district financing is available there, it is not as commonly used. Some developers still use traditional private equity or retained earnings to fund public improvements for their projects, especially in locations where special district financing is not available. The lack of special district financing typically results in smaller-scale and less amenitized masterplans, which is unfortunate for local residents. For more information on our consulting services for master-planned communities, contact any of our consulting experts. If you have any questions, please contact Devyn Bachman at (303) 956-9881 or by email.